Emerson 5471 direct drive new furnace Rescue motor, 5-5/8″ diameter x 6-1/16″ long, 4 speed, 208-230V, adjustable to 3/4, 1/2, 1/3, 1/4 or 1/5hp, 1075RPM, 1.7-3.8A, shaft size 1/2″ x 5″, reversible, ball bearing, mounts with belly band (not included), 4 studs on both ends, or 4 screws in shell. 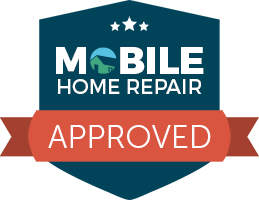 1 year replacement warranty. 3/4hp setting requires a G21-909 run cap (not included), all other hp settings require G21-891, Read general info at top of page. Emerson 5470 direct drive new furnace Rescue motor, 5-5/8″ diameter x 6-1/16″ long, 4 speed, 115V, adjustable to 3/4, 1/2, 1/3, 1/4 or 1/5hp, 1075RPM, 3.1-8.1A, shaft size 1/2″ x 5″, reversible, ball bearing, mounts with belly band (not included), 4 studs on both ends, or 4 screws in shell. 1 year replacement warranty. 3/4hp setting requires a G21-909 run cap (not included), all other hp settings require G21-891, Read general info at top of page. Emerson 8905 direct drive new furnace motor, 5-5/8″ diameter x 5-3/8″ long, 3 speed, 208-230V, 3/4hp, 1075RPM, 4.6A, shaft size 1/2″ x 4″, reversible, sleeve bearing, mounts with belly band (not included) or 4 studs on shaft end, 1 year replacement warranty. Requires run cap G21-891 (not included). Read general info at top of page. Emerson 5461 direct drive new furnace Rescue motor, 5-5/8″ diameter x 4-13/16″ long, 4 speed, 208-230V, adjustable to 1/2, 1/3, 1/4, 1/5 or 1/6hp, 1075RPM, 1.3-3.6A, shaft size 1/2″ x 5″, reversible, sleeve bearing, mounts with belly band (not included), 4 studs on both ends, or 4 screws in shell. 1 year replacement warranty. 1/2hp setting requires a G21-891 run cap (not included), all other hp settings require G21-930, Read general info at top of page. 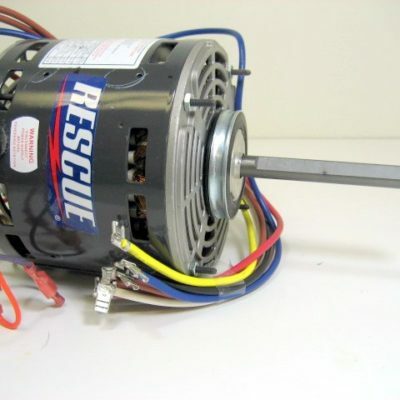 Emerson 5460 direct drive new furnace Rescue motor, 5-5/8″ diameter x 4-13/16″ long, 4 speed, 115V, adjustable to 1/2, 1/3, 1/4, 1/5 or 1/6hp, 1075RPM, 2.8-7.3A, shaft size 1/2″ x 5″, reversible, sleeve bearing, mounts with belly band (not included), 4 studs on both ends, or 4 screws in shell. 1 year replacement warranty. 1/2hp setting requires a G21-891 run cap (not included), all other hp settings require G21-930, Read general info at top of page. Emerson 1973 direct drive new furnace motor, 5-5/8″ diameter x 4-13/16″ long, 3 speed, 208-230V, 1/2hp, 1075RPM, 4.6A, shaft size 1/2″ x 5″, reversible, sleeve bearing, mounts with belly band (not included) or 4 studs on shaft end, 1 year replacement warranty. Requires run cap G21-933 (not included). Read general info at top of page. 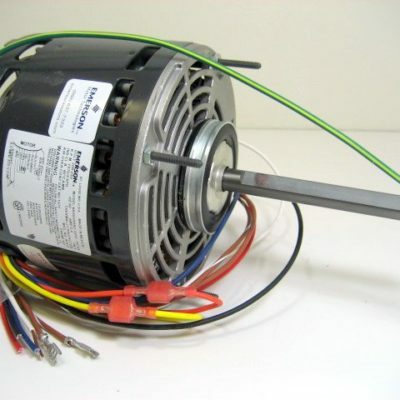 Emerson 1868 new 48 frame condenser fan motor, 5-5/8″ diameter x 4-11/16″ long, 1 speed, 208-230V, 3/4hp, 1075RPM, 4.5A, shaft size 1/2″ x 5″, reversible, sleeve bearing, mounts with belly band (not included) or 4 studs on shaft end, 1 year replacement warranty. Requires run cap G21-891 (not included) or an appropriate dual run cap. Read general info at top of page. Emerson 8904 direct drive new furnace motor, 5-5/8″ diameter x 5-3/8″ long, 3 speed, 115V, 3/4hp, 1075RPM, 9.1A, Shaft size 1/2″ x 4″, reversible, sleeve bearing, mounts with belly band (not included) or 4 studs on shaft end, 1 year replacement warranty. Requires run cap G21-897 (not included). Read general info at top of page. Emerson 1862 new 48 frame condenser fan motor, 5-5/8″ diameter x 5-1/8″ long, 1 speed, 208-230V, 1/2hp, 1075RPM, 2.9A, shaft size 1/2″ x 5″, reversible, sleeve bearing, mounts with belly band (not included) or 4 studs on shaft end, 1 year replacement warranty. Requires run cap G21-933 (not included) or an appropriate dual run cap. Read general info at top of page. 1/4hp, 1075rpm, 5-5/8″ diameter, 1/2 x 5″ shaft, 115V. 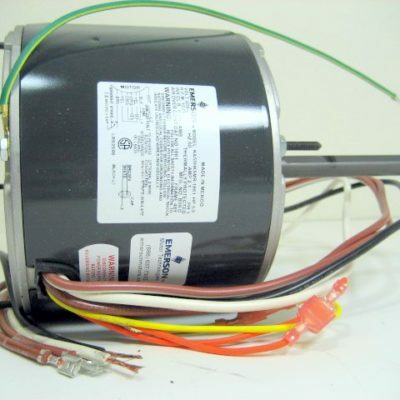 This generic 3-speed motor replaces the following Coleman 1-speed motors that are no longer available: 8866-3159, 8866-315, 8866A3159, 8866A315, 7700-3119, 7700-311, 7700A3119, 7700A311, 7710-3119, 7710-311, 024-23071-000, 02423071000, 024-21620-000, 02421620000, 024-21620-700 & 02421620700. Connect to low speed using red and white wires. Connect brown wires to run cap. If motor turns backwards, switch the yellow and orange wires. Ignore all other wires. Requires run cap G21-930. Emerson 1863. Emerson 1864 direct drive new furnace motor, 5-5/8″ diameter x 4-5/16″ long, 3 speed, 115V, 1/3hp, 1075RPM, 5.2A, shaft size 1/2″ x 5″, reversible, sleeve bearing, mounts with belly band (not included) or 4 studs on shaft end, 1 year replacement warranty. Requires run cap G21-933 (not included). Read general info at top of page. Emerson 1972 direct drive new furnace motor, 5-5/8″ diameter x 4-5/16″ long, 3 speed, 208-230V, 1/3hp, 1075RPM, 2.4A, shaft size 1/2″ x 5″, reversible, sleeve bearing, mounts with belly band (not included) or 4 studs on shaft end, 1 year replacement warranty. Requires run cap G21-930 (not included). Read general info at top of page. Emerson 1971 direct drive new furnace motor, 5-5/8″ diameter x 4-1/16″ long, 3 speed, 208-230V, 1/4hp, 1075RPM, 1.8A, shaft size 1/2″ x 5″, reversible, sleeve bearing, mounts with belly band (not included) or 4 studs on shaft end, 1 year replacement warranty. Requires run cap G21-930 (not included). Read general info at top of page. Emerson 1861 new 48 frame condenser fan motor, 5-5/8″ diameter x 4-5/8″ long, 1 speed, 208-230V, 1/3hp, 1075RPM, 2.1A, shaft size 1/2″ x 5″, reversible, sleeve bearing, mounts with belly band (not included) or 4 studs on shaft end, 1 year replacement warranty. Requires run cap G21-933 (not included) or an appropriate dual run cap. Read general info at top of page. Emerson 1860 new 48 frame condenser fan motor, 5-5/8″ diameter x 4-1/8″ long, 1 speed, 208-230V, 1/4hp, 1075RPM, 1.7A, shaft size 1/2″ x 5″, reversible, sleeve bearing, mounts with belly band (not included) or 4 studs on shaft end, 1 year replacement warranty. Requires run cap G21-930 (not included) or an appropriate dual run cap. Read general info at top of page. Emerson 1865 direct drive new furnace motor, 5-5/8″ diameter x 5-1/4″ long, 3 speed, 115V, 1/2hp, 1075RPM, 8.9A, shaft size 1/2″ x 5″, reversible, sleeve bearing, mounts with belly band (not included) or 4 studs on shaft end, 1 year replacement warranty. Requires run cap G21-891 (not included). Read general info at top of page. 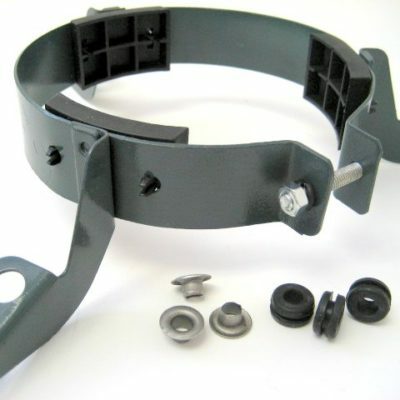 S58-703 Belly Motor Mounting Band. Motor torsion flex mount fits 5.5″ diameter motors. Includes rubbers. 9″ or 10″ mounting centers. 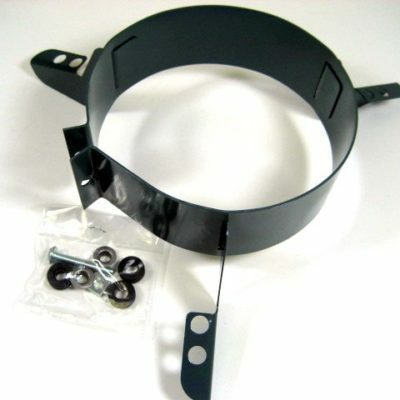 S58-612 Belly Motor Mounting Band. Motor torsion flex mount fits 5″ and 5.5″ diameter motors. Remove the three plastic sleeves to fit 5.5″ motors. Includes 3 rubbers with inserts. Hole size 1/4″ diameter. Install rubbers into the appropriate hole on mount, then add insert. 9″ and 10″ mounting centers.